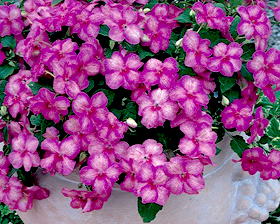 Unique flower pattern adds sparkle to semi-shady garden beds and containers. 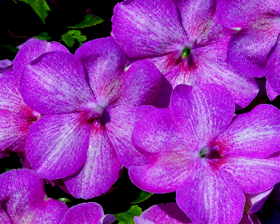 ‘Mosaic™ Lilac’ Impatiens Flower Seed produces medium to darkly-colored foliaged plants atop which sit the most incredibly pinky-lilac blossoms washed with white highlights. The signature of the Mosaic Series, these beautifully patterned blossoms bring light and color together in one amazing package! Great flower power and garden performance. Height: 25-30cm.